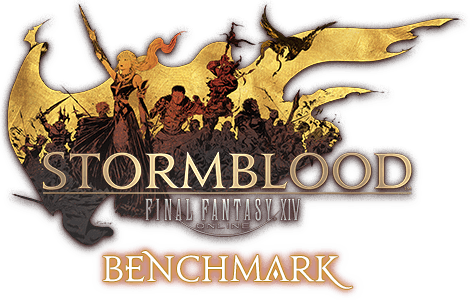 Only the FINAL FANTASY XIV: Stormblood benchmark software is available for download. The FINAL FANTASY XIV Windows® PC version is not included. To download and use the software, please read and agree to the below license agreement. Please understand that this software is not guaranteed to run on all systems. The performance of the benchmark and FINAL FANTASY XIV may differ. Please use this software for reference only. IMPORTANT: PLEASE CAREFULLY READ THIS SOFTWARE LICENSE AGREEMENT (“AGREEMENT”) BEFORE INSTALLING THE FINAL FANTASY XIV: STORMBLOOD BENCHMARK SOFTWARE (“BENCHMARK SOFTWARE”). All copyrights in the BENCHMARK SOFTWARE are owned by SQUARE ENIX, Inc. or its affiliate companies, (the “Licensor”). The Licensor grants you a non-transferable, revocable, non-exclusive license to use the BENCHMARK SOFTWARE. In no event does the Licensor sell or transfer the BENCHMARK SOFTWARE to you. You may install and use the BENCHMARK SOFTWARE on a personal computer owned by you (each a “Computer”). You may use the BENCHMARK SOFTWARE only to test the performance of a FINAL FANTASY XIV game or a FINAL FANTASY XIV expansion pack for Windows to run on your Computer, but not for any other purposes including, without limitation, commercial use. You may not decompile, disassemble, reverse engineer, or translate the BENCHMARK SOFTWARE. THE LICENSOR MAKES NO WARRANTY THAT THE BENCHMARK SOFTWARE IS OPERABLE OR FUNCTIONAL UNDER ANY CONDITION. THE LICENSOR MAY MODIFY THE BENCHMARK SOFTWARE FROM TIME TO TIME WITHOUT PRIOR NOTICE TO YOU. THE LICENSOR PROVIDES YOU WITH THE BENCHMARK SOFTWARE ON AN “AS IS” BASIS FOR FREE. LICENSOR EXPRESSLY DISCLAIMS ALL WARRANTIES OF ANY KIND, EXPRESS, IMPLIED OR STATUTORY FOR THE BENCHMARK SOFTWARE AND THE TEST RESULT OBTAINED BY USING THE BENCHMARK SOFTWARE (THE “RESULT”), INCLUDING WITHOUT LIMITATION, THE IMPLIED WARRANTIES OF ACCURACY, PERFECTION, MERCHANTABILITY, FITNESS FOR A PARTICULAR PURPOSE, AND RELIABILITY. THE BENCHMARK SOFTWARE DOES NOT EVALUATE THE OVERALL PERFORMANCE OF YOUR COMPUTER. YOU SHALL USE THE TEST RESULT FOR PURCHASE OR RECONFIGURATION OF THE COMPUTER AT YOUR OWN RISK AND RESPONSIBILITY. LICENSOR IS NOT RESPONSIBLE OR LIABLE FOR DAMAGES OF ANY KIND, ARISING OUT OF, OR IN CONNECTION WITH, YOUR USE OF THE BENCHMARK SOFTWARE. LICENSOR IS NOT RESPONSIBLE OR LIABLE FOR ANY INDIRECT, PUNITIVE, SPECIAL, INCIDENTAL, OR CONSEQUENTIAL DAMAGES, EVEN IF LICENSOR WAS AWARE OF THE POSSIBILITY OF SUCH DAMAGES. IN NO EVENT WILL LICENSOR'S LIABILITY TO YOU EXCEED THE TOTAL AMOUNT PAID BY YOU FOR USE OF THE BENCHMARK SOFTWARE (NOT INCLUDING WHAT YOU PAID FOR THE USE OF ANY SOFTWARE PACKAGED WITH THE BENCHMARK SOFTWARE). The Licensor may terminate the Agreement without prior notice. Upon termination, you shall uninstall the BENCHMARK SOFTWARE entirely from the Computer, and destroy all copies of the BENCHMARK SOFTWARE. This Agreement shall be governed by, construed, interpreted and executed in accordance with the laws of the state of California without regard to its conflicts of law provisions. If any provision of this Agreement is held to be invalid or unenforceable, the remaining provisions shall be fully effective and enforceable. Licensor and you hereby irrevocably agree to the exclusive jurisdiction of California state and its Federal Courts in connection with any proceeding, suit or action arising out of or in connection with this Agreement. No waiver by Licensor of any term, provision or condition of this Agreement, whether by conduct or otherwise, in any one or more instances, shall be deemed to be or be construed as a further or continuing waiver of any such term, provision or condition or as a waiver of any other term, provision or condition of this Agreement. Furthermore, no failure or delay by Licensor in exercising its rights or remedies constitute a waiver by Licensor. This BENCHMARK SOFTWARE is not guaranteed to run on all systems. Due to issues such as compatibility with hardware and other software, there is the possibility that this BENCHMARK SOFTWARE may not run on your computer. Passing this BENCHMARK SOFTWARE’S benchmark test does not provide any guarantee that the FINAL FANTASY XIV game or a FINAL FANTASY XIV expansion pack (as applicable) will run on your computer. Make sure you have read over and understand these warnings before using this BENCHMARK SOFTWARE. Updated on January 20, 2017.